built in magnifier by triple tapping your Home Button and in case of iPhone X, triple press the Side Button. Apple has added lots of features and functions integrated on iPhone and iPad which can be used in our daily life like camera, calculator, flashlight, stocks, magnifier, document scanning, notes and more. Apple added a magnifier function with the introduction of iOS 10 that allows you to use your iPhone as a magnifying glass. Magnifier of iPhone lets you use your iOS devices camera to quickly magnify things. 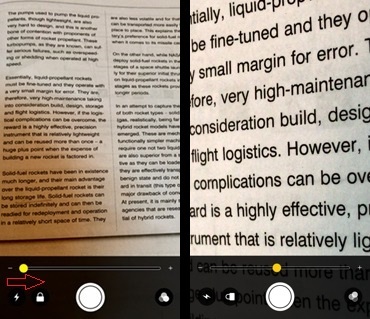 You can enable flashlight, photo filters from the magnifier. If you have any object and want to use magnifying glass then you can use your iPhone as a magnifier only from iOS 10, iOS 11 or later. To start magnifier, and quickly magnify any things triple click the Home Button of your iPhone or iPad. Follow the steps below to use your iPhone as a Magnifying Glass on iPhone 5S/SE, iPhone 6/6S, iPhone 6 Plus/6S Plus, iPhone 7/7 Plus and iPhone 8/ 8 Plus running iOS 11.3.1/11.2.1/11.1.2/11/10. Step 5# The magnifying glass will then automatically open so that you can magnify any objects with your iPhone. Choose Magnifier where you can see many options like zoom in out, photo filters, flashlight and more. There is slightly different way to enable Magnifier on iPhone X. Just Triple press the Side button to enable and use Magnifier. Dark Mode for Facebook Messenger Coming Soon!